Obituary for Mrs. Barbara Jean (West) Johnson | Hinchliff-Pearson-West, Inc.
Barbara Jean (West) Johnson, 97, a resident of Rock Island, Illinois since the mid 1970’s and previously of Galesburg and Knoxville, Illinois, died October 4, 2018, in Rock Island. 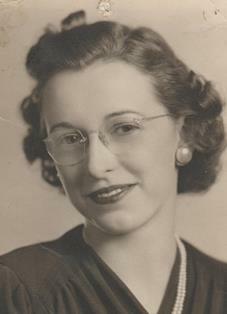 She was born August 9, 1921, in Galesburg, the only child of Maude (Ely) and William E. West. She married Robert L. Johnson, of Galesburg, in Kahoka, Missouri, January 16, 1943. She is survived by sons, William R. (Linda Lee Peterson) Johnson of Morton, Illinois and Barrie L. Johnson of San Francisco, California; daughter-in-law, Linda (Cortez-King) Johnson of Georgetown, Texas; many grandkids and great grandkids; sister-in-law, Virginia (Johnson) Cascino of Rochester, Minnesota; and many nieces and nephews and their children. She was preceded in death by Robert, her husband of 70 years; his parents; her parents; her youngest son, Byron Johnson of Texas; brothers-in-law, Jack Long Sr. and Dr. Joseph Cascino; and sister-in-law, Barbara (Johnson) Long. Barbara graduated from Galesburg High School in 1939 and continued on to graduate from Brown’s Business College. She then did clerical/bookkeeping work for several years in Galesburg until she became a full-time homemaker. Over the ensuing years, she did volunteer work at Cottage Hospital, and later, for her church. She was a baptized member of Trinity Lutheran Church in Galesburg. After moving to Rock Island, she became a member of St. James Lutheran Church. She attended B.P.O. Elks 894 events in Galesburg with her husband, who was a member. They loved to slow dance. Upon moving to the Quad Cities area, she attended Viking Club events at Thor Lodge 97 in Moline, where her husband was a member, and they continued dancing while they were able. Later in life, when they couldn’t participate in the dancing anymore, they liked listening to the music, talking with their friends, and enjoying club dinners. Barbara enjoyed taking care of her flowers and viewing and visiting historical places around the country with her family. She was an avid letter writer and was always ready to send out cards and letters to stay in touch with friends and relatives right up to the end. The funeral service will be 1:30 p.m. Saturday, October 13, 2018 at Hinchliff-Pearson-West Funeral Directors and Cremation Services Galesburg Chapel, 1070 W. Fremont St., Galesburg, IL 61401. There will be no visitation. Burial will be in the West family plot at the Knoxville Cemetery in Knoxville, Illinois immediately following the service. In lieu of flowers, you may donate to the Galesburg Railroad Museum. Barbara’s father retired the C.B.&Q Railroad after 50 years working at the Galesburg offices. The donation may be sent to Galesburg Railroad Museum, 211 S. Seminary St., Attn. Barbara Jean Johnson Memorial Fund, Galesburg, IL 61401. To order flowers from local Galesburg florists, or to leave an online condolence, please visit www.h-p-w.com.